Genus: Fritillaria Tourn. 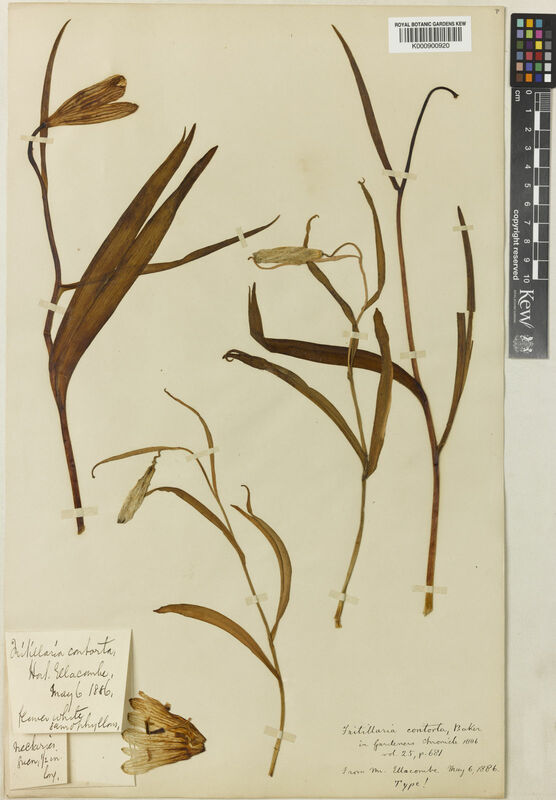 ex L.
Fritillaria meleagris was named by the Swedish botanist Carl Linnaeus in 1753. 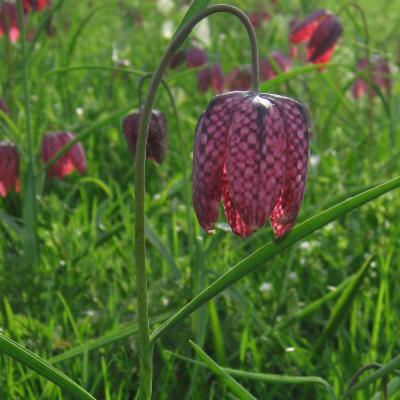 The generic name Fritillaria comes from the Latin word fritillus, meaning dice box (which were formerly chequered), in reference to the chequered markings on the flowers. The specific epithet meleagris likens it to a 'spotted guinea fowl'. Fritillaria meleagris is commonly found in damp grassland and meadows subject to winter flooding. 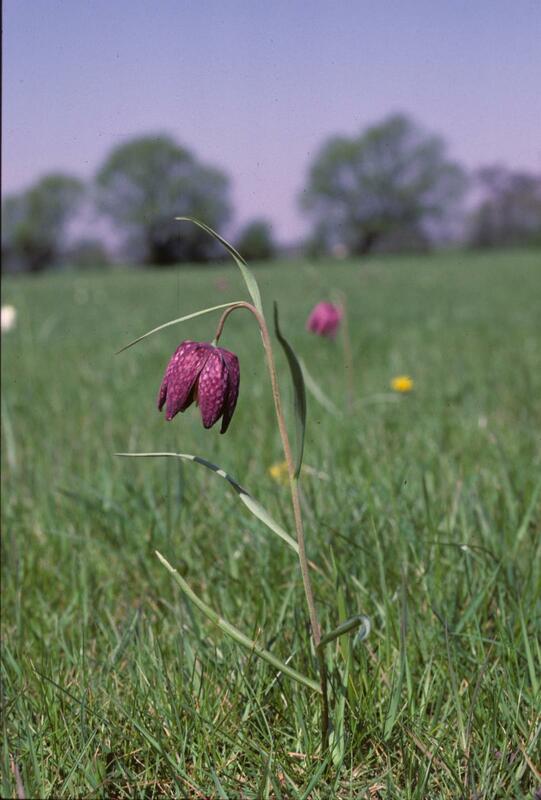 A reduction of the habitats favoured by snake's head fritillary (for example, due to the conversion of grassland to arable use, and by 'improving' grassland through fertilisation) has resulted in the species becoming infrequent in the wild. The native status of F. meleagris in Britain has been the subject of much debate. It was first recorded in the wild there only in 1736 and it has therefore been suggested that it is likely to be a neophyte (recently introduced species). Snake's head fritillary has stunning, chequer-patterned flowers, and has become quite rare in the wild. Snake's head fritillary occurs in the wild from Great Britain and central Russia south to the southern Alps, western Balkans and the Altai Mountains. This species has become naturalised in Denmark, Finland, Norway, Sweden and the Baltic region. It favours damp, sometimes winter-flooded, neutral grasslands, usually those traditionally managed for hay with some grazing. Snake's head fritillary has a globose bulb with a few compressed scales covered by a thin, transparent tunic (outer coating). The flowering stem (peduncle) is 12-30 cm long and bears 4-6 linear, glaucous leaves. There is usually one pendent flower per peduncle. The perianth (petals and sepals) is very broadly (square-shouldered) bell-shaped, comprising purple, pink or white segments with a characteristic chequered purple pattern (although a white form also occurs). The green nectaries are towards the base of the inner perianth segment surfaces, and measure approximately 7-10 x 1.5 mm. The filaments are 10-13 mm long and are covered with short, rounded projections. The style is 13-16 mm long and is three-cleft, with branches 2-5 mm long. The fruit is an erect, flat-topped, 6-angled capsule (a dry and dehiscent fruit composed of more than one carpel). Fritillaria meleagris flowers from late March to April. The flowers are hermaphrodite (having both male and female organs) and are pollinated by bees. The plant is also capable of self-fertilisation. Assessed as Nationally Scarce in the UK in 2007 (according to non-IUCN criteria). The lowland grassland habitat favoured by Fritillaria meleagris is in decline. 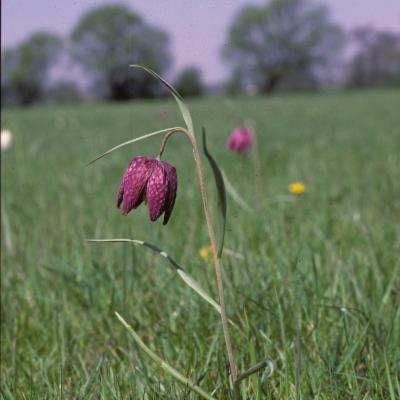 Snake's head fritillary is considered to be extinct in the Czech Republic and threatened in Romania, the Ukraine, Hungary, Switzerland and Slovakia. F. meleagris is much less common in England than formerly, and is included in a number of English local Biodiversity Action Plans. 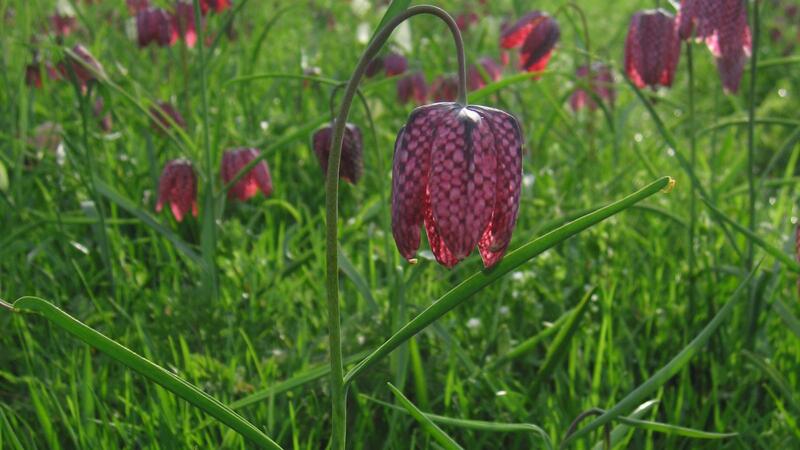 Snake's head fritillary has been cultivated as an ornamental in Great Britain since at least 1578 (during the Tudor period, 1485-1603), and was first discovered growing wild in 1736. 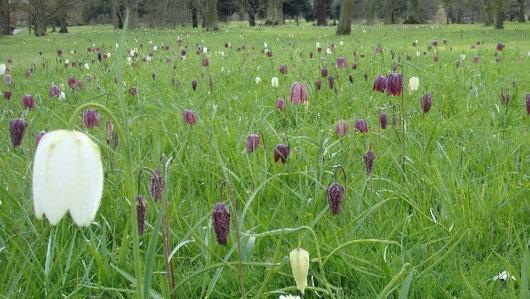 Apart from obvious plantings, such as those at Kew, a good place to see fritillaries is at the famous Magdalen College Meadow in Oxford. The English village of Ducklington (in Oxfordshire) holds a Fritillary Sunday festival; fritillaries grow in a meadow close to the village, but they were once more abundant here and elsewhere along the River Thames. Indeed, flowers were so abundant around Ducklington that they used to be picked and sent to Covent Garden flower market in London. As suitable grasslands disappeared, so too did the fritillaries, and this rural industry vanished. Fritillaria meleagris is best grown in the open garden, naturalised in a grassy meadow or planted in an herbaceous border or rock garden. The bulbs should be planted in a position that is not too hot and dry in the summer. Although the bulbs are dormant at this time, they do not need to be kept completely dry, and a little moisture in the soil is beneficial, as long as it is never waterlogged. Growth begins in autumn, but little is seen above ground until late winter. At Kew, flowering usually occurs in late March or early April. A sunny or partially shaded position is best, such as under deciduous trees or shrubs or against an east or west-facing wall. Propagation is from seed sown in autumn or early winter and plants often seed nearby once a colony is established. 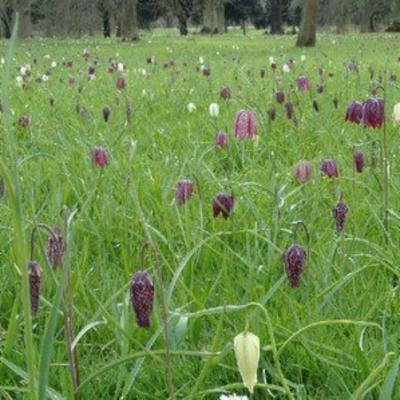 Planted along Princess Walk at Kew, 30,000 snake's head fritillaries add colour and spectacle to the spring flowering bulb displays. They can also be seen along Riverside Walk, where they usually flower in April. Flowering between April and May, 1,600 snake's head fritillary bulbs bring a delicate and elegant swathe of beauty to the Bog Garden at Wakehurst. Dried and alcohol-preserved specimens of Fritillaria meleagris are held in Kew's Herbarium, where they are available to researchers from around the world, by appointment. In flowering plants, the amount of DNA within a nucleus (often called genome size) can vary nearly 2,400-fold. Compared with our own relatively slim genome, which would stretch 2 m if all the DNA in a cell was unravelled, some bulbous monocots contain much larger genomes. The genus Fritillaria is particularly interesting as it includes species with some of the most obese genomes so far reported in plants. Although Fritillaria meleagris does not have the largest genome, it still has an enormous amount of DNA (more than 15 times as much as humans have) and its genome would stretch over 30 m if unravelled. In Kew's Genetics section in the Jodrell Laboratory, work is currently being undertaken to investigate how and why Fritillaria genomes have become so big. We are taking advantage of recent developments in high-throughput DNA sequencing and chromosome painting strategies to study selected Fritillaria species (including F. meleagris ) to provide insights into the dynamics and evolution of the DNA sequences which comprise the bulk of their obese genomes. This has been made possible through a three-year Natural Environment Research Council (NERC)-funded grant (2010-2013). From open woods and grassy places, usually on floodplains, to alpine pastures. National Biodiversity Network Gateway (2011). Fritillaria meleagris. Plants for a Future (2010). Fritillaria meleagris. World Checklist of Selected Plant Families (2010). Fritillaria meleagris. The Board of Trustees of the Royal Botanic Gardens, Kew. Pearman, D.A. (2007). ‘Far from any house’ – assessing the status of doubtfully native species in the flora of the British Isles. Watsonia 26: 271–290. Aeschimann, D. & Heitz, C. (2005). Index synonymique de la Flore de Suisse et territoires limitrophes (ISFS). Doc. Flor. Helv. 2: 1-323. Witkowski, Z.J., Król, W. & Solarz, W. (eds.) (2003). Carpathian List of Endangered Species. WWF and Institute of Nature Conservation, Polish Academy of Sciences, Vienna-Krakow. Preston, C.D., Pearman, D.A. & Dines, T.A. (eds) (2002). New Atlas of the British and Irish Flora: An Atlas of the Vascular Plants of Britain, Ireland, the Isle of Man and the Channel Islands. Oxford University Press, Oxford. Harris, J.G. & Woolf Harris, M. (2001). Plant Identification Terminology. Spring Lake Publishing, Spring Lake, Utah. Mabey, R. (1996). Flora Britannica. Chatto & Windus, London. Rix, E.M. (1980). Fritillaria. In: Flora Europaea Volume 5, ed. T.G. Tutin, V.H. Heywood, N.A. Burges, D.M. Moore, D.H. Valentine, S.M. Walters & D.A. Webb, pp. 31-34. Cambridge University Press, Cambridge.